It's really a nice little meter. It's just 20 years after its time. This is yet another attempt at an ultra-simple, direct-read meter. A very clever idea: a plastic disc with a selenium cell on the back and a simple meter face on front. There's a plastic ring on the front that's calibrated for a specific film and shutter speed (e.g. Kodak Plus-X at 1/125th). You hold it upright at eye-level, aim it at the scene, and it tells you the aperture. The ring has four different films. You pop the front cap off, turn the dial to the film you're using, and snap everything back together and you're good to go. It's nicely weighted, it fits comfortably in the hand, it would slip easily in a shirt pocket. It's uniquely styled and very clever. In the early 1950s it really would have turned heads. Unfortunately, it came out in the summer of 1968, and I have no idea what market they thought they were targeting at that time. The people who would have wanted simple meters like this would now be shooting Instamatics which rarely had lens adjustments. 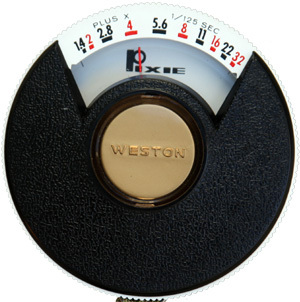 The people who had meter-less adjustable cameras were usually better amateurs who wanted a meter that read speed and aperture combinations, like a Master V or a nice Sekonic Micro-Leader. Further evidence of some sort of reality disconnect in New Jersey: if you wanted to use a shutter speed other than 1/125th, you could simply use the conversion table in the owner's manual. Because people who carry super-simple meters like his are always going to have their owner's manual at hand, right? What if you want to use one of the many films that aren't on the disc? Buy a conversion dial. Why not add it in to the package to begin with? To save cost? The booklet is printed in color. The box is printed in color. The shoestring neckcord is color. The meter itself is colorful and attractively styled. Obviously Weston didn't cheap out on this. So the Pixie came and rapidly went, burning money that probably would have been better spent on a follow up or companion to their well-regarded Ranger 9. Market to the pros and let Sekonic have the point-n-shoot niche.